Siddharth Banerjee’s elderly parents lived by themselves in their two-storeyed house in Kolkata. Every night before going to bed, his father, who suffered from knee and hip joint problems, arduously climbed the stairs to check whether all the doors and windows were locked. He would then painfully climb down the stairs to retire in peace. Next morning, the same, excruciating drill. For the elderly, especially the ones nursing ailments, such seemingly simple tasks can be quite uphill. Pained at seeing his parents' ordeal, Banerjee tried to find a suitable home automation system. However, the ones available in the market were operable only through smartphones, which his parents had never really gotten the hang of. With plain vanilla home automation systems not cutting it, Banerjee decided to build one of his own. “When you mention automation, the popular notion is being able to control lights and fans...We stopped using the word ‘automation’ and started using ‘smart living,' which is more than just controlling lights and fans,” Banerjee explains. The idea resonated with his three friends and former colleagues, Sriram Padmananbhan, Krithika Radhakrishnan, and Arindam Chatterjee. About 11 months ago, the four came together to float CosineLabs, which makes intelligent automation systems that let you operate through voice, gestures, and one-touch switches. Previously, Banerjee was chief technology officer at product engineering firm Wow Labz. He has also worked at custom IT services provider SunGard in the past, where he met Padmanabhan. 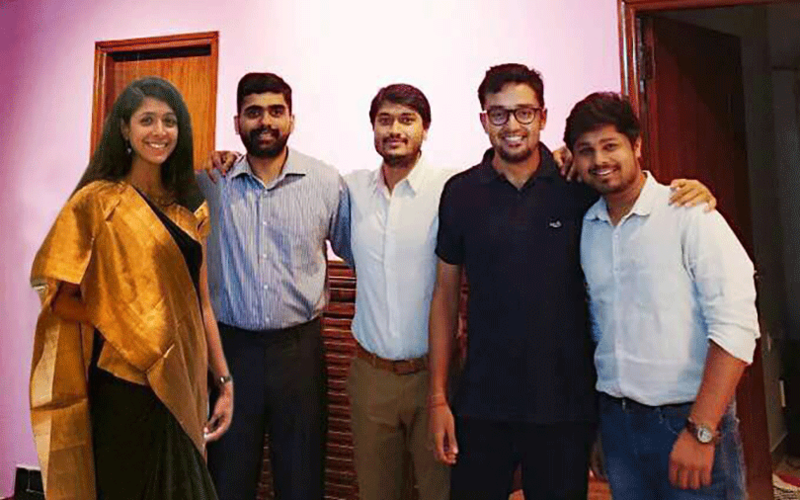 Padmanabhan oversees the finance function at the startup while Radhakrishnan, who earlier worked with Goldman Sachs, handles marketing. Chatterjee, who is based out of Minnesota, takes care of the company’s US operations. Currently, the startup is bootstrapped and has less than 10 team members. One of the reasons, says Banerjee, that adoption of home automation has been slow in India is because it restricts itself to mobiles. “If you think about a home, it houses both five-year-old kids and eighty-year-old elderly, and they can’t control from a mobile app. But they can do gestures and use a one-touch switch,” he explains. CosineLabs' proprietary AIME (short for 'artificial intelligence and me') technology consists of cameras and sensors that turn off the lights, fans and air-conditioning if there is no one in the room. It switches these appliances back on when someone enters the room. After it has analysed the user’s sleep schedule over time, AIME can control the intensity of lights and entertainment systems. With a mere gesture, it can close all the doors and windows of the house. If you are outside, you can see, using the app, who is at the door and choose to let them in. You can also ask AIME to book a cab for you, or even ask for the day’s news. “Intelligence allows the system to proactively do things, rather than wait for your command. And you can interact with it through multiple ways, voice being the easiest,” says Banerjee. However, considering how accents change across regions in India, building a glitch-free voice-enabled home automation system was no walk in the park. AIME currently talks in English, but is learning Hindi and regional languages as well. Apart from being a personal assistant, AIME also doubles up as a health monitor. Using integration points like fitness bands, it can get information on one's heart rate, sleep patterns and the number of steps walked, among other things. If you have been a couch potato all day, it will prompt you to go for a run. If you are sleep-deprived, it will dim the lights and play soft music so you can sleep comfortably. AIME can also detect family members, and set the room’s lighting and air-conditioning according to their preferences. That's not all. In case of a gas leak or short-circuit, the system sends an alert on the app. Given most Indian cities still don't have uninterrupted power supply, building in power backup was necessary. “We built power backup supply in our modules. The main module has a backup of close to 18 hours, so even if there is a power failure or someone switches off power while leaving, the important security aspects still work,” Banerjee explains. CosineLabs is currently working with business-to-business clients only, creating solutions for entrance management and security, among other things. “We are currently working with three builders. We have not gotten into business-to-consumer since the cost of customer acquisition is high. However, it is in the pipeline,” Banerjee said. The system can be installed in both new and existing homes, at any point during the construction or the handover. Banerjee didn't share details on how much it takes to automate a house, but claimed CosineLabs' solution was the "most affordable" out there. Another challenge AIME has faced was the frequent surge in voltage levels in India. “Power surge often ruined the circuits. We had to go back to the drawing board and put resistance in all devices to handle the surge. We cannot predict a surge, but 99% of it can be handled now,” he said. The co-founders installed AIME in their own homes first, when developers were still testing the product. “When I came back, suddenly the curtain motors would start and lights would be on, giving the impression of a haunted place...Someone would be trying to debug and execute some code,” Banerjee quips. The home automation space is still nascent in India, with just a few homegrown startups raising funds in the past one year. However, multiple European brands have an indirect presence here through tie-ups with appliance brands.